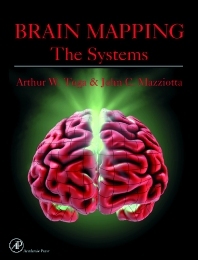 Brain mapping has forever altered and extended our understanding of the systems of the brain. The integrative capacity of brain maps enables the inclusion of a diverse array of observations and experimental results. Maps are used to describe brain structure, function, and connectivity, to catalog the ever-expanding knowledge base of human and animal nervous systems, to compare healthy tissue with diseased tissue, and to show detailed subsystems and circuits. Students and professionals in neuroscience, neurology, neuropsychology, biophysics, neuroengineering, radiology, and computer science. A.W. Toga, An Introduction to Maps and Atlases of the Brain. M.E. Raichle, A Brief History of Human Functional Brain Mapping. L.W. Swanson, A History of Neuroanatomical Maps. J.C. Mazziotta, A Probabalistic Approach for Mapping the Human Brain. L. Porrino and P.S. Goldman-Rakic, Cortex. J.D. Schmahmann, Cerebellum and Brainstem. J. Watson, The Human Visual System. S.T. Grafton, The Human Motor System. R.R. Zatorre, The Human Auditory System. R.R. Zatorre, Olfactory and Gustatory Systems. M. Iacaboni, Attention and Sensorimotor Integration: Mapping the Embodied Mind. E. Halgren, The Human Memory System. H.S. Mayberg, Emotion and Mood. A.-C. Nobre and M.-M. Mesulam, Cognition. S.M. Kosslyn, Neural Systems Activated During Visual Mental Imagery: A Review and Meta-Analyses. F. Chollet, Plasticity of the Adult Human Brain.